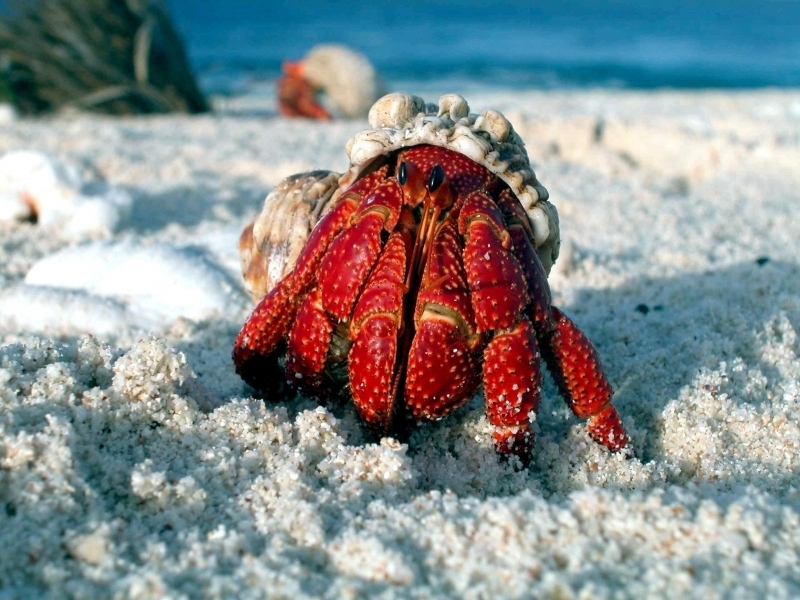 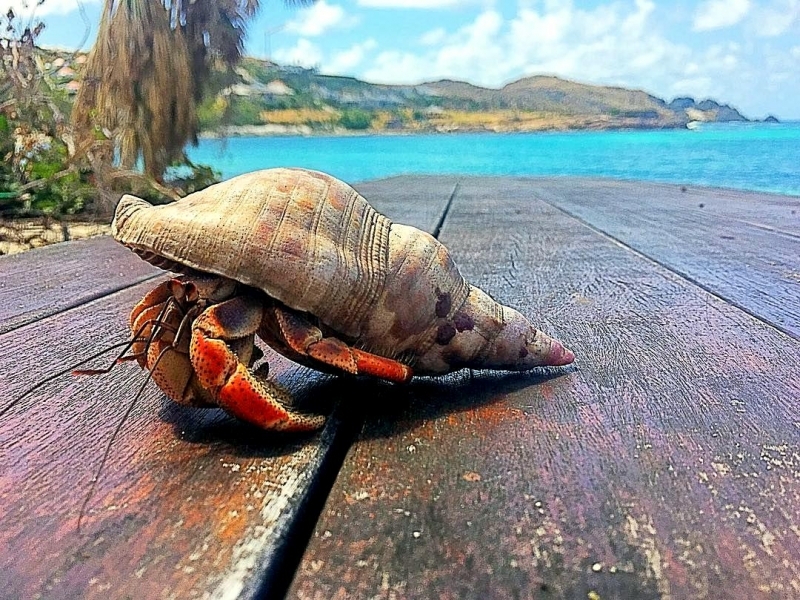 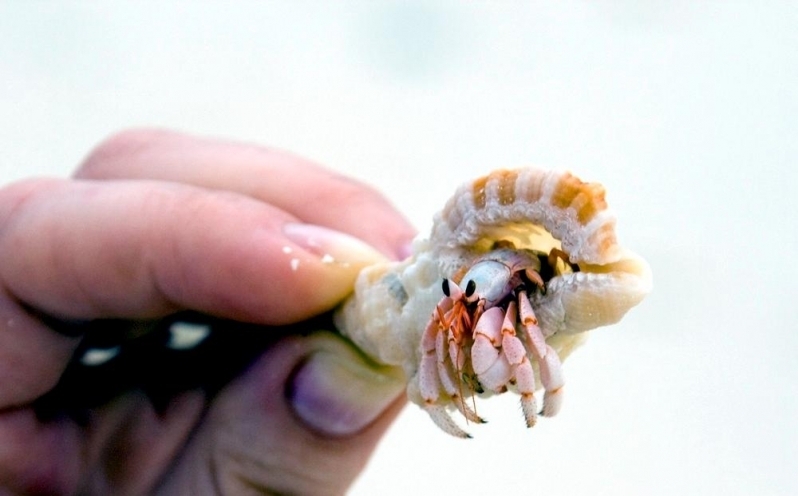 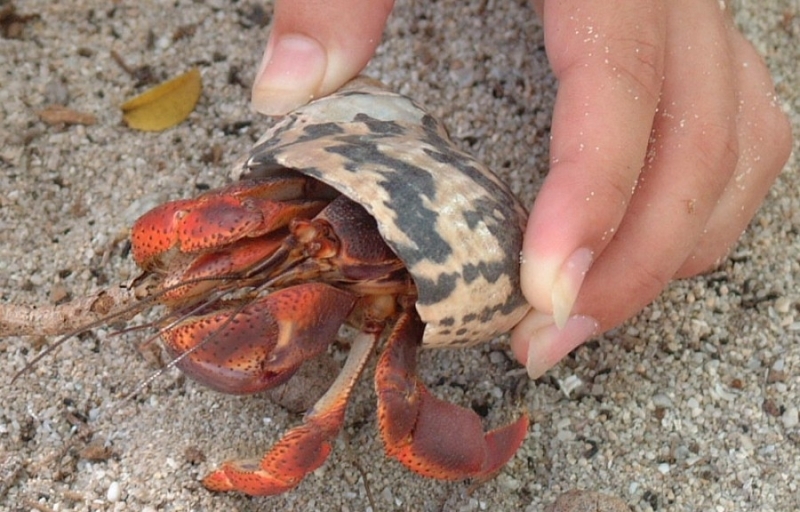 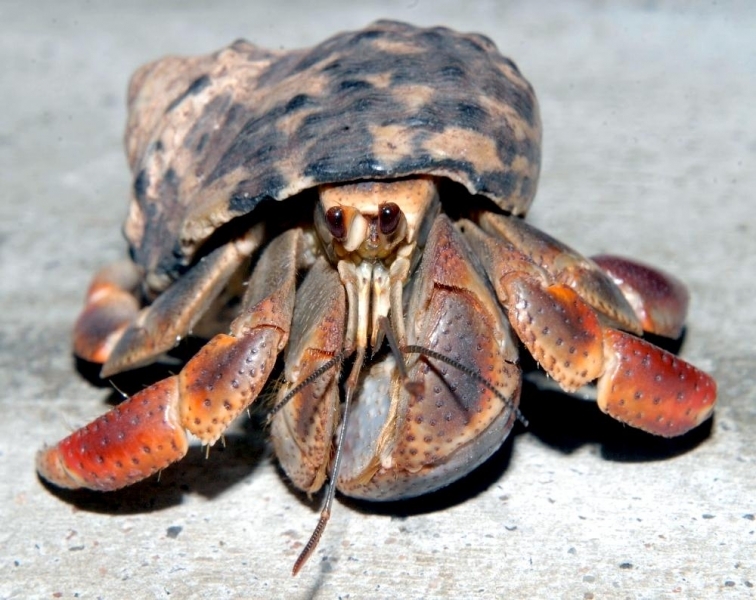 The Hermit Crab is a type of crab that doesn’t have a very hard shell. 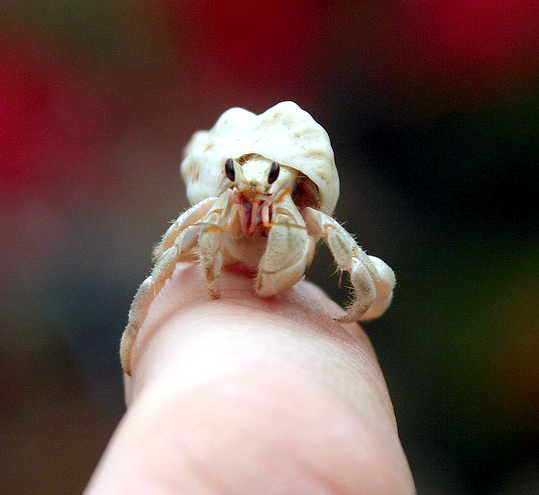 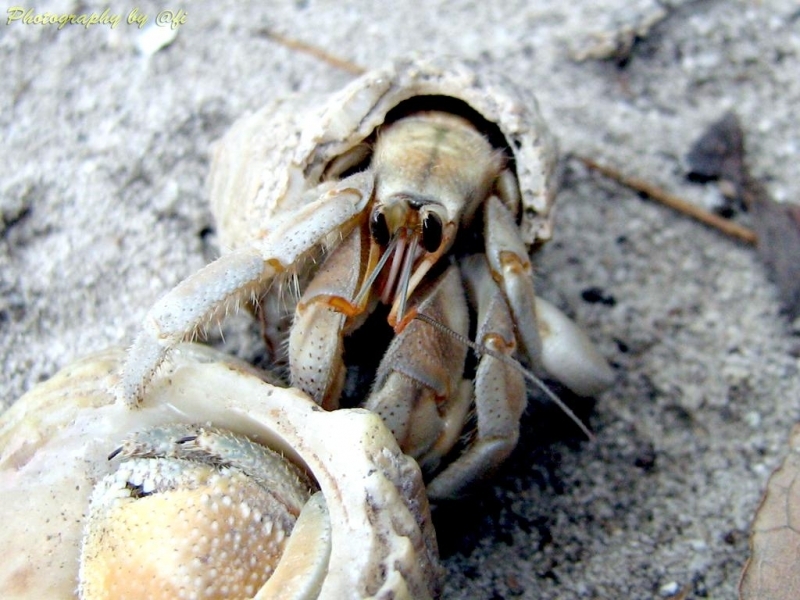 Not a true crab, it uses other animals’ old shells for protection; they especially like old Whelk shells. 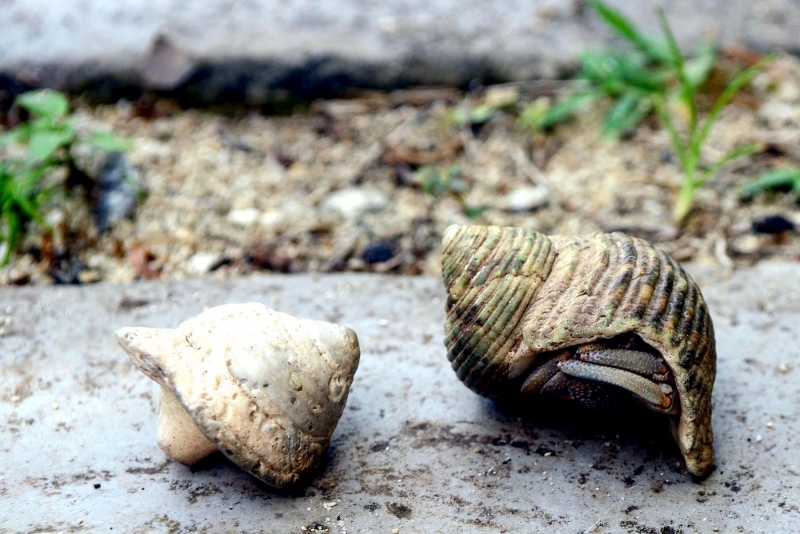 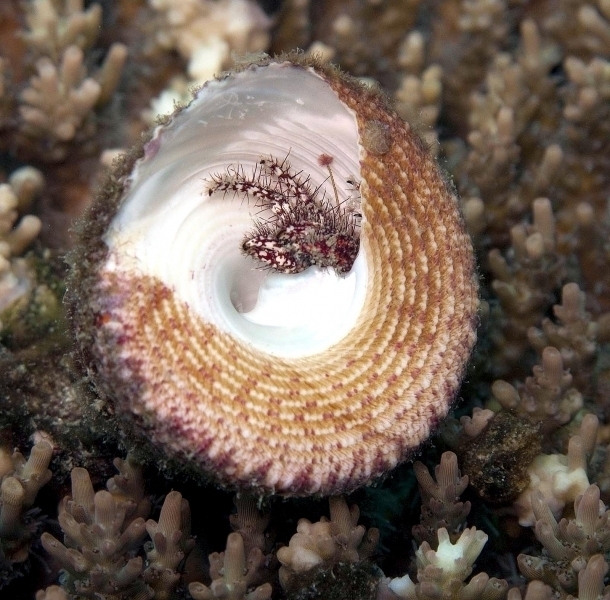 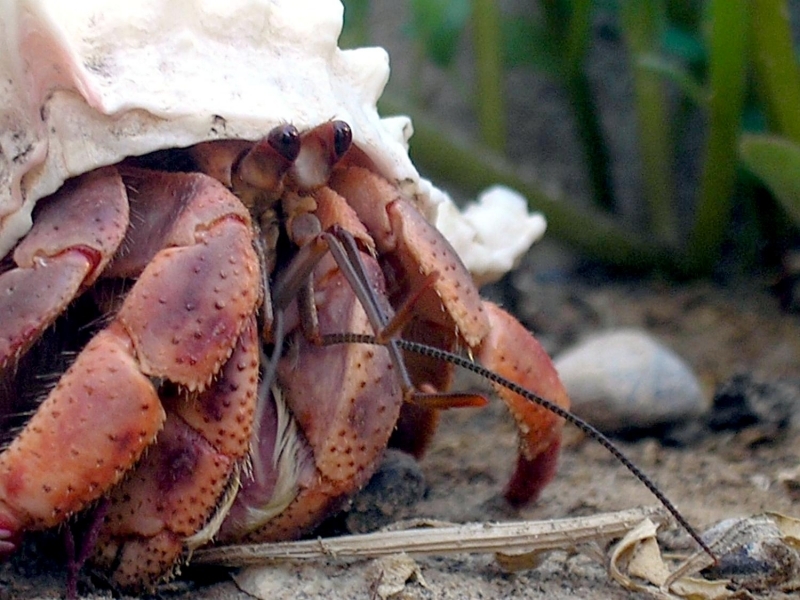 As the Hermit Crab grows in size, it must find a larger shell. 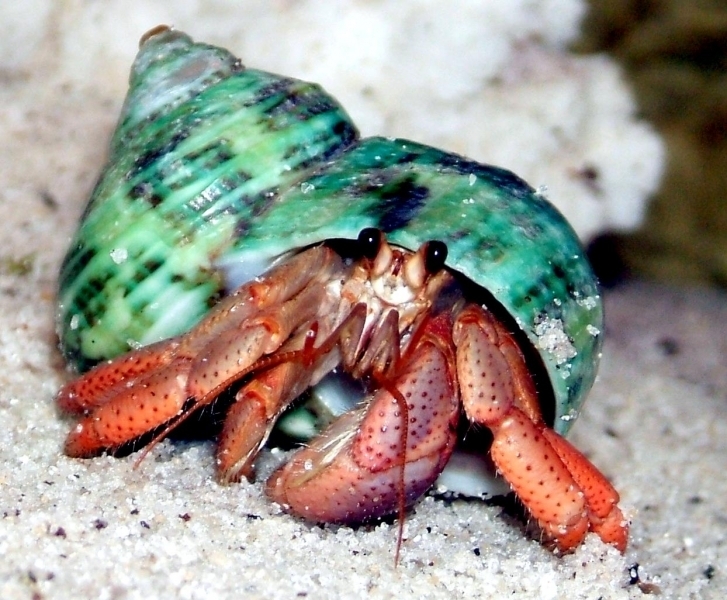 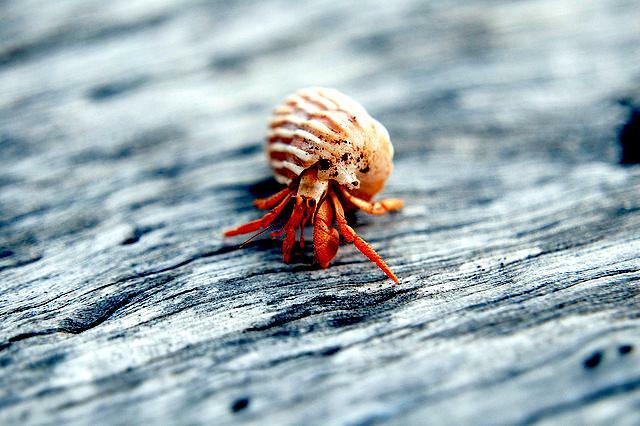 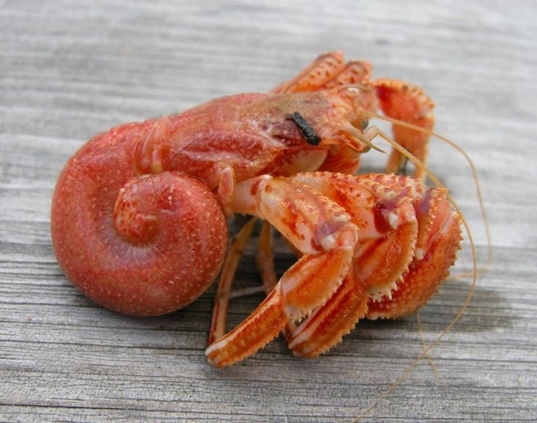 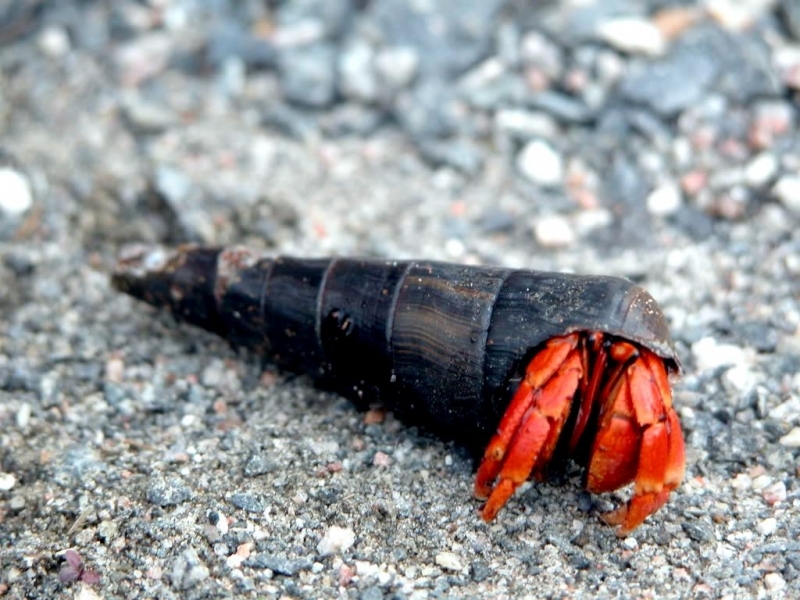 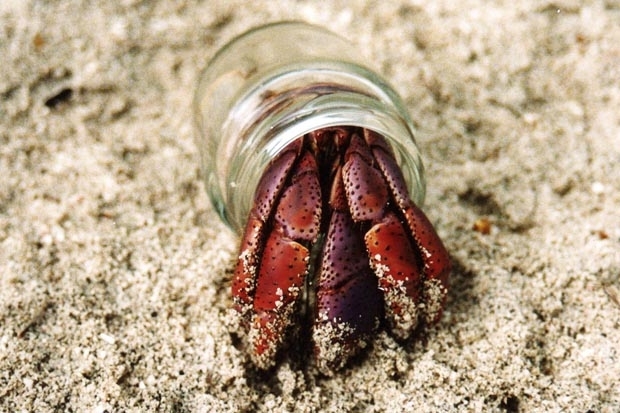 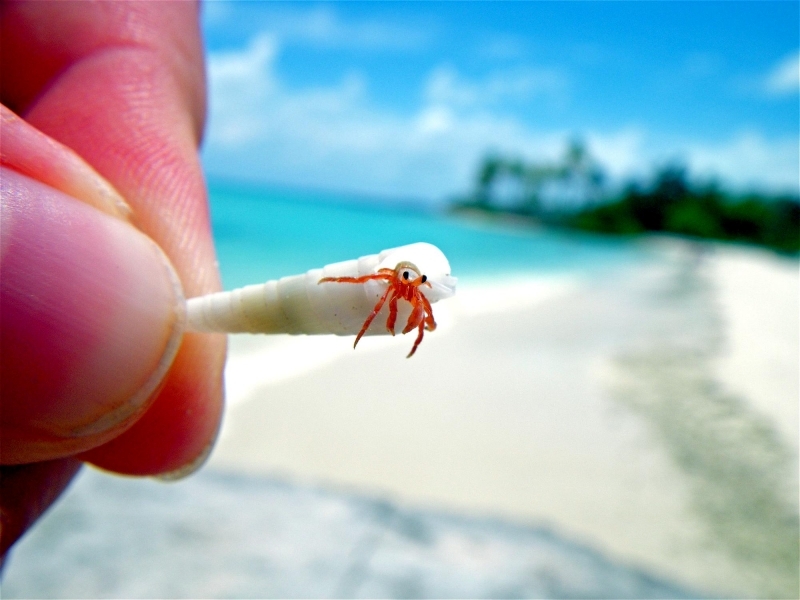 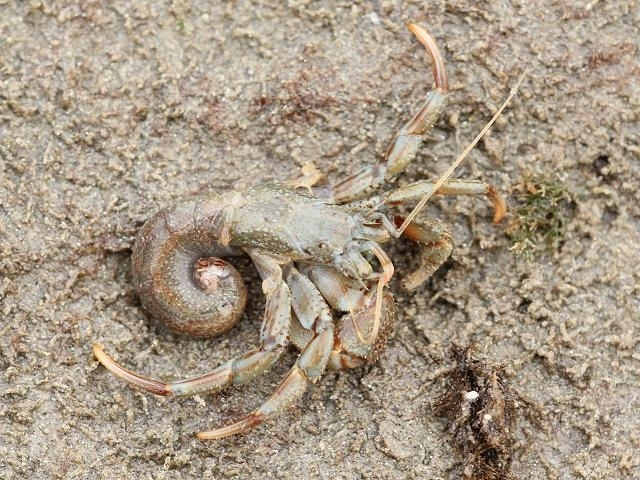 The Hermit Crab is a crustacean. 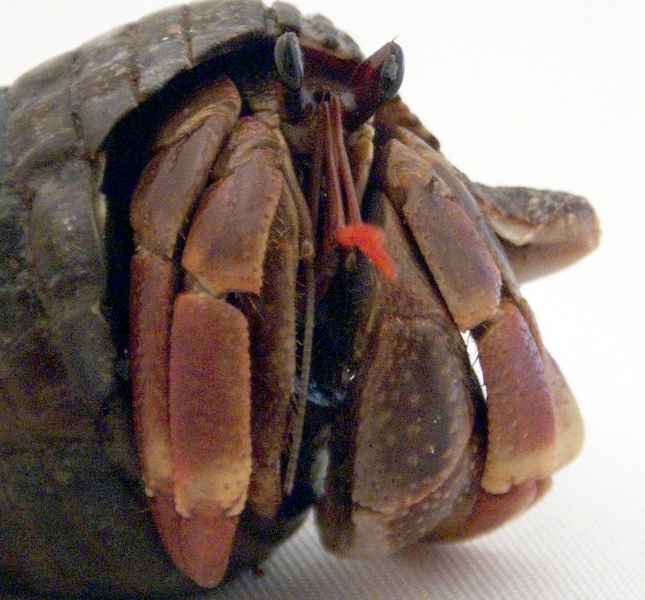 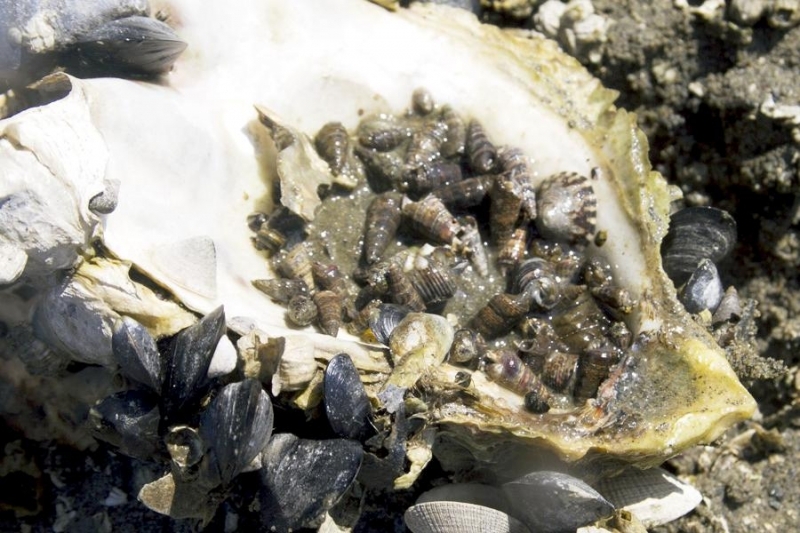 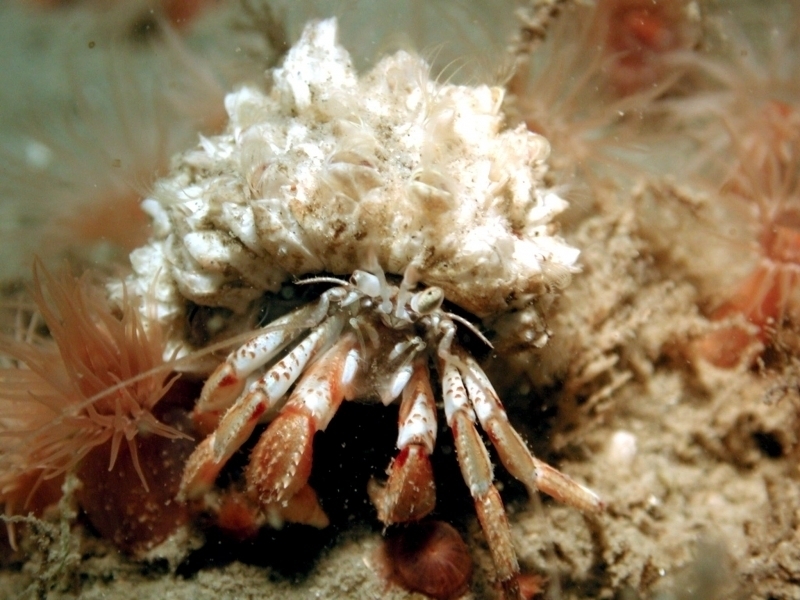 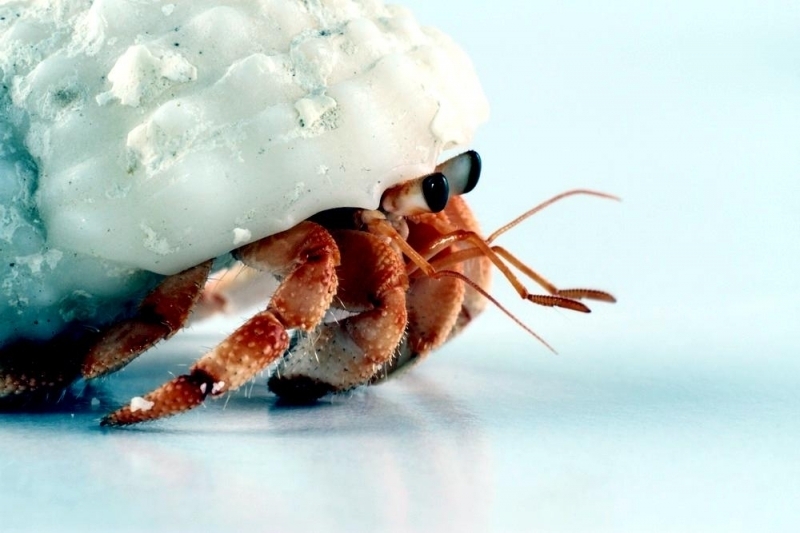 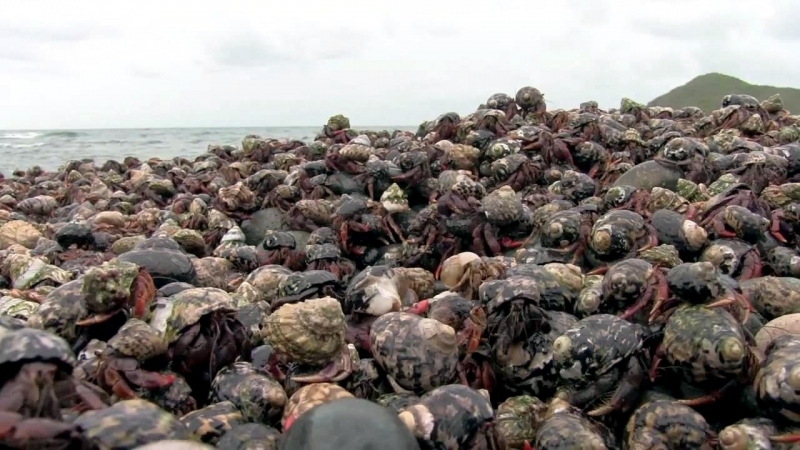 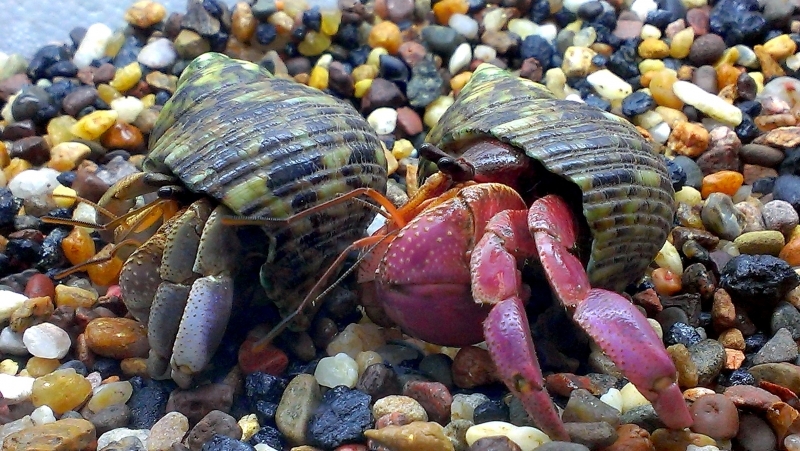 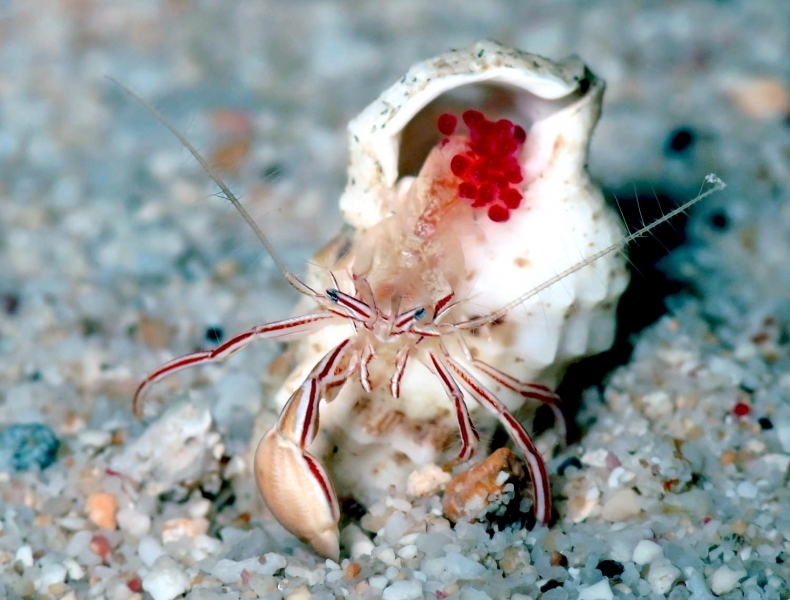 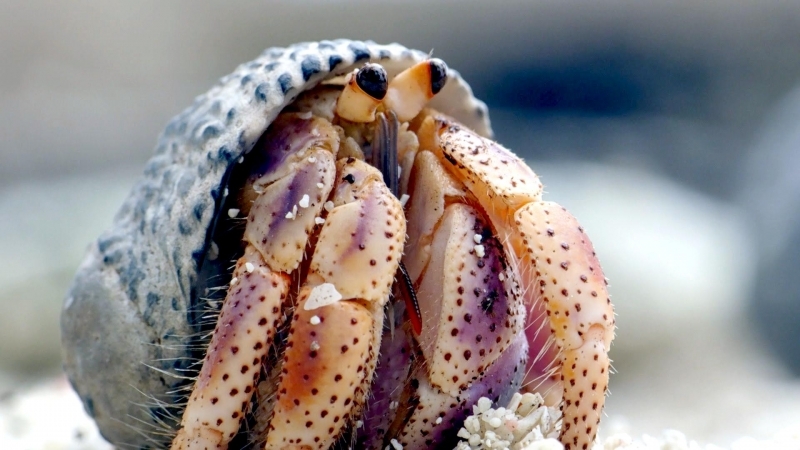 Most Hermit Crabs live on the ocean floor, but many live on land. 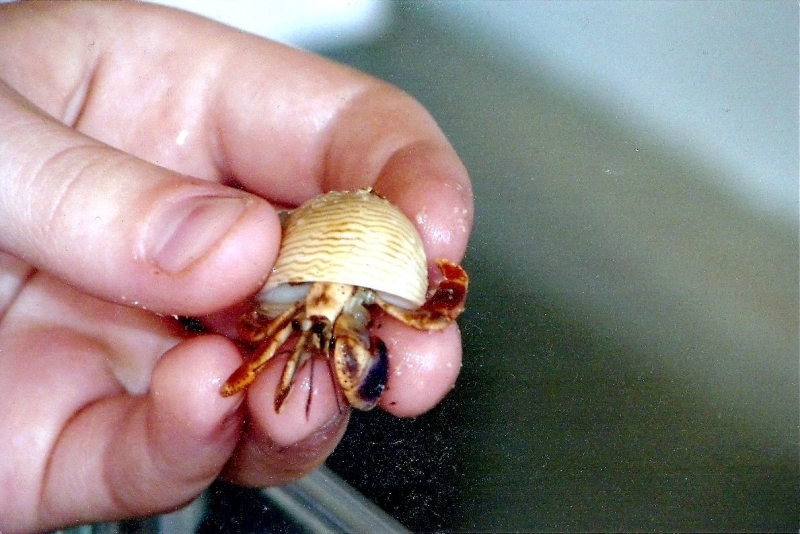 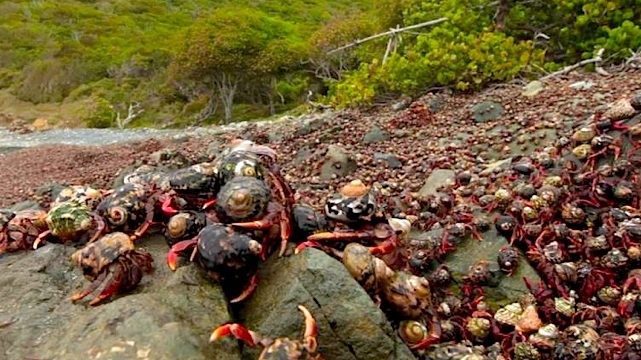 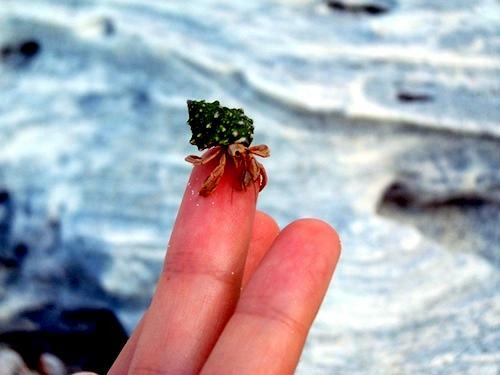 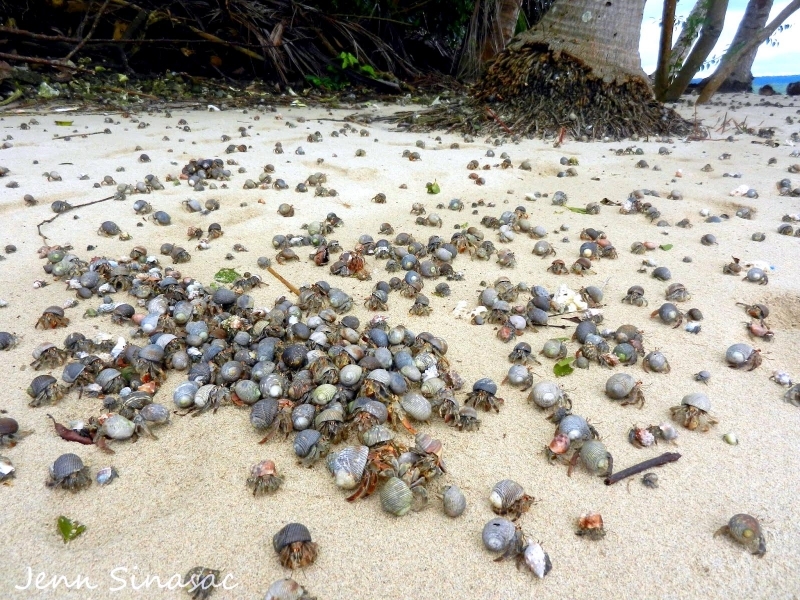 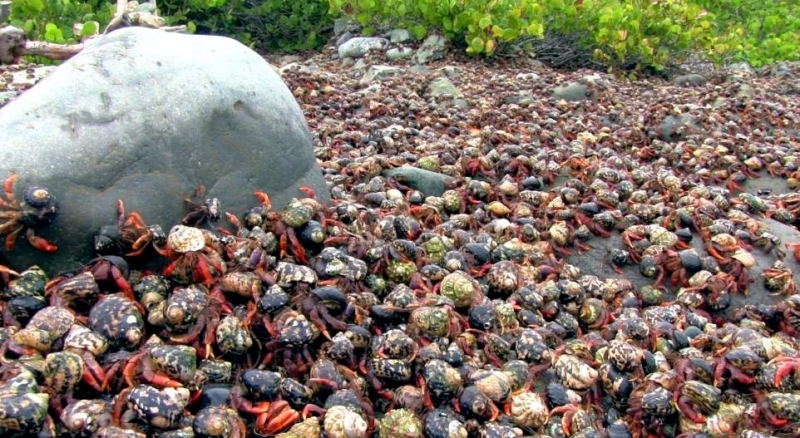 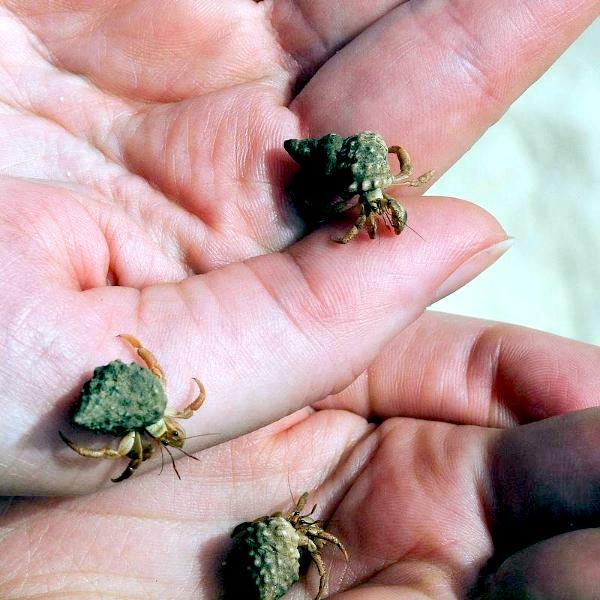 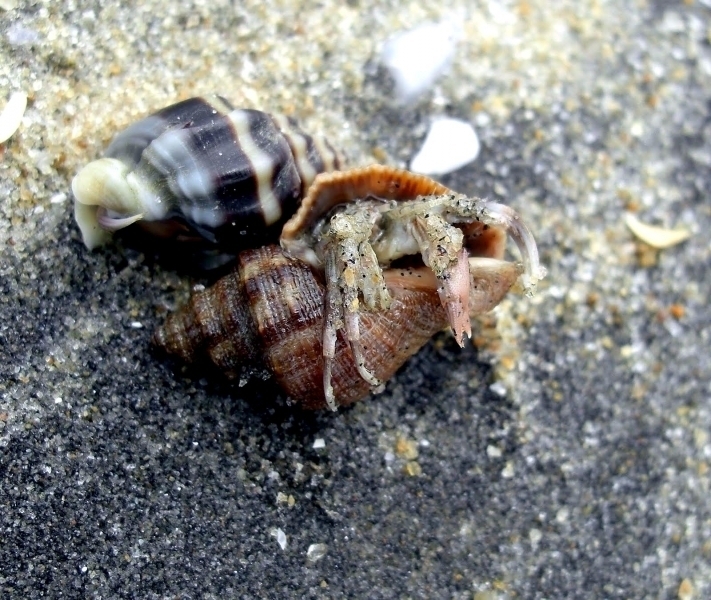 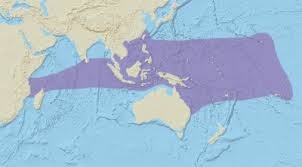 Female terrestrial (land based) Hermit Crabs must return to the sea to breed. 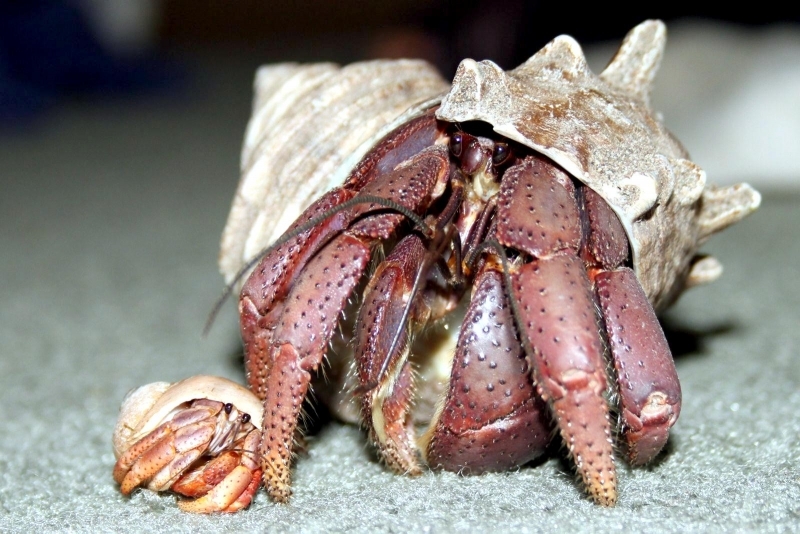 Hermit Crab are invertebrates, animals without a backbone. 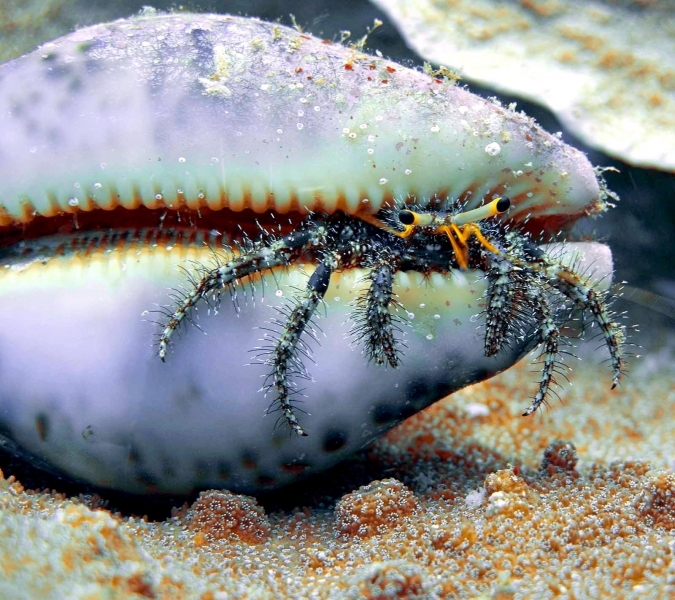 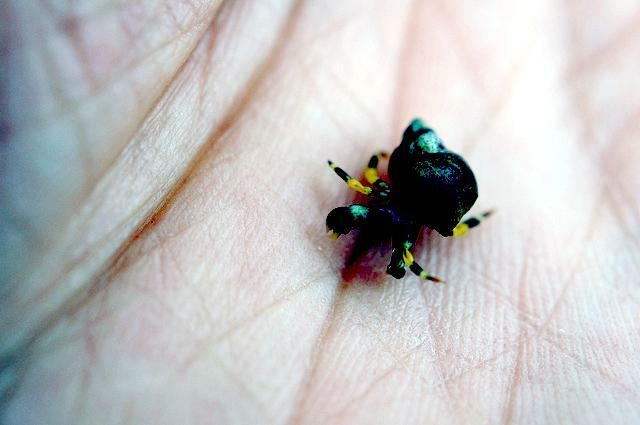 They have an exoskeleton, an outer shell that provides support for their body but does not provide much protection from predators. 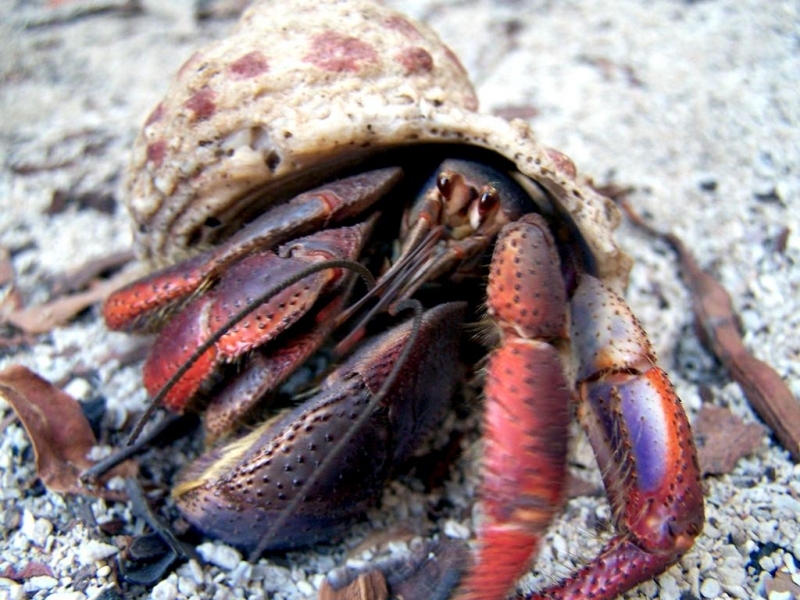 They vary widely in color from red to brown to purple with stripes, dots and other patterns. 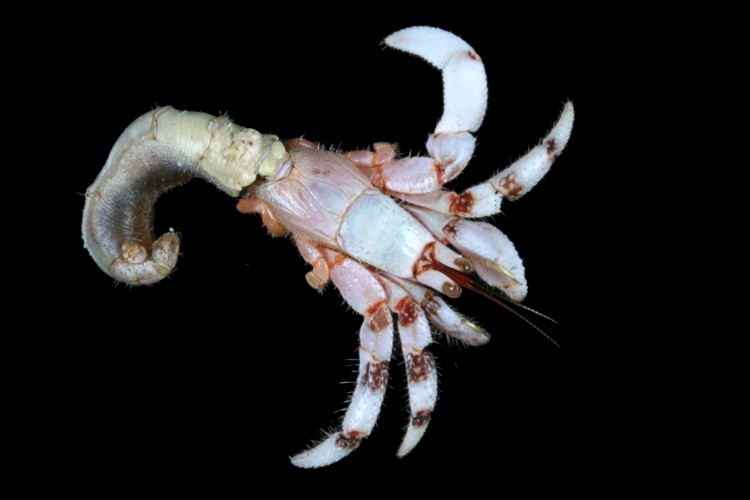 They have 10 jointed legs; the front 2 legs have large, grasping claws called pincers or chelipeds and the rear pair of legs are very small. 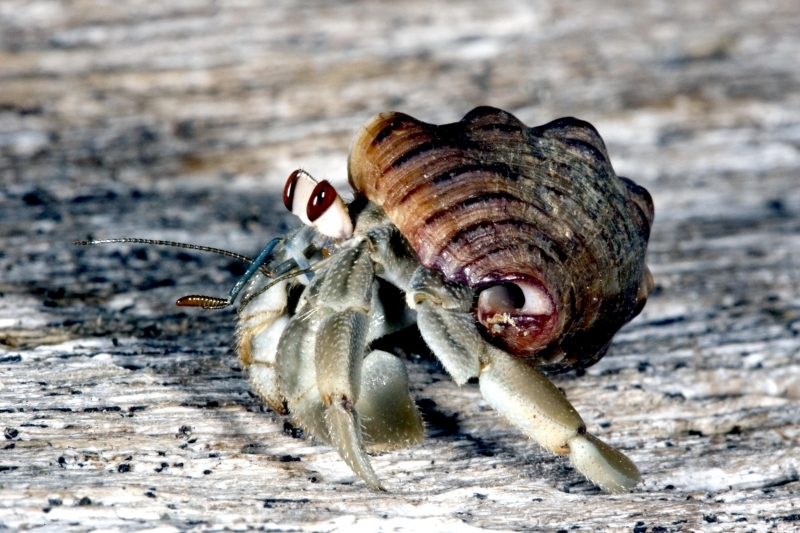 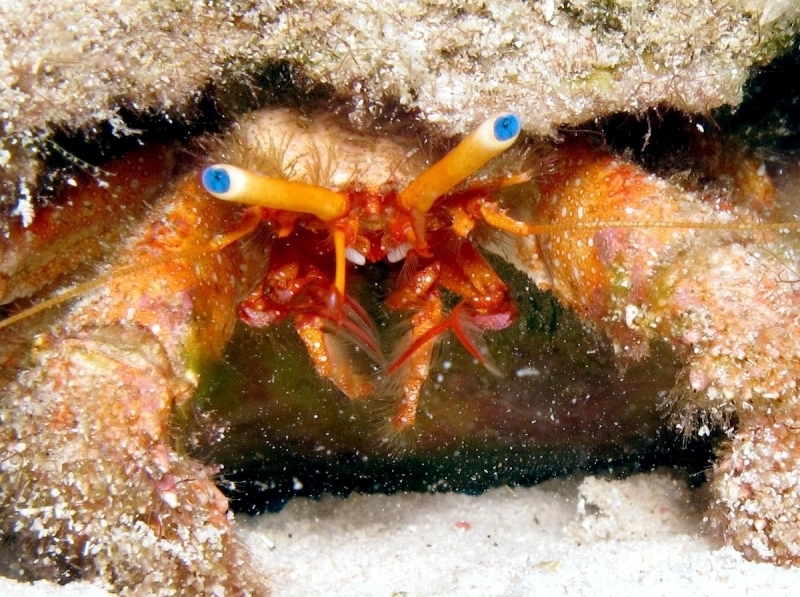 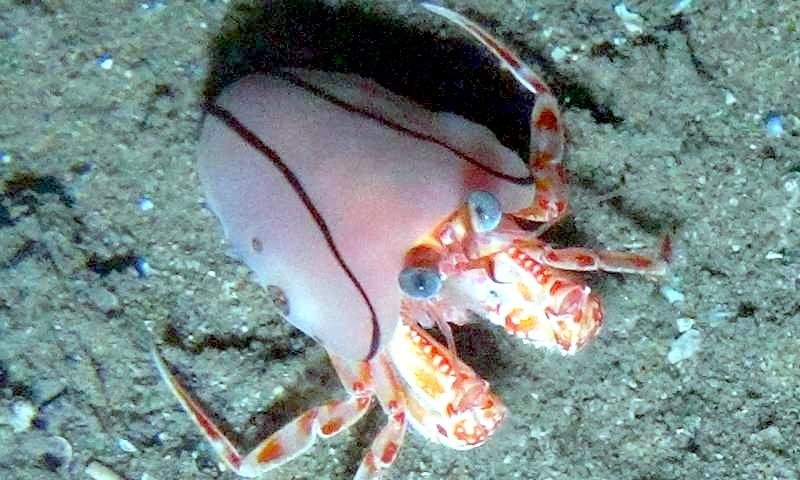 They have a flattened body, sensory antennae, 2 eyes located at the ends of stalks and a soft, twisted abdomen which the Hermit Crab keeps hidden inside its shell. 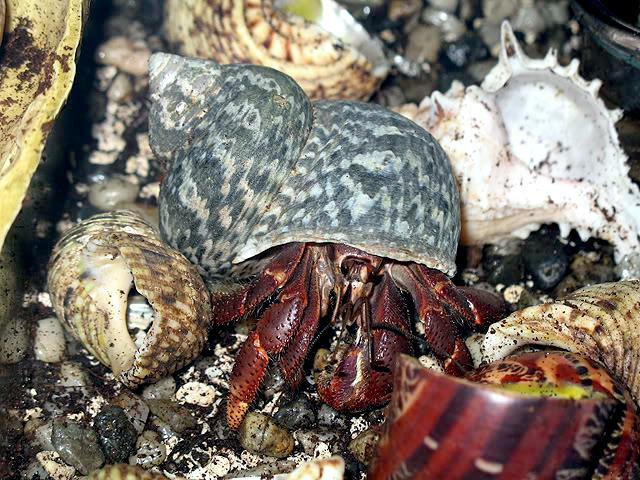 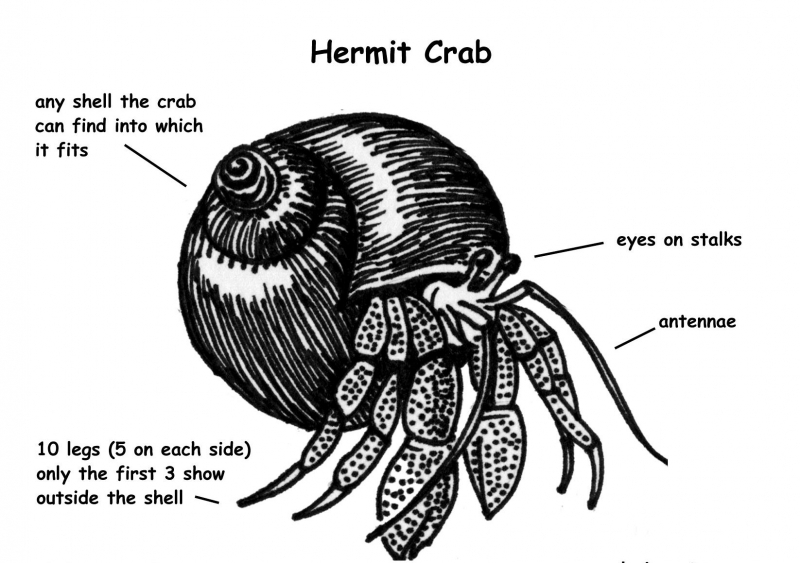 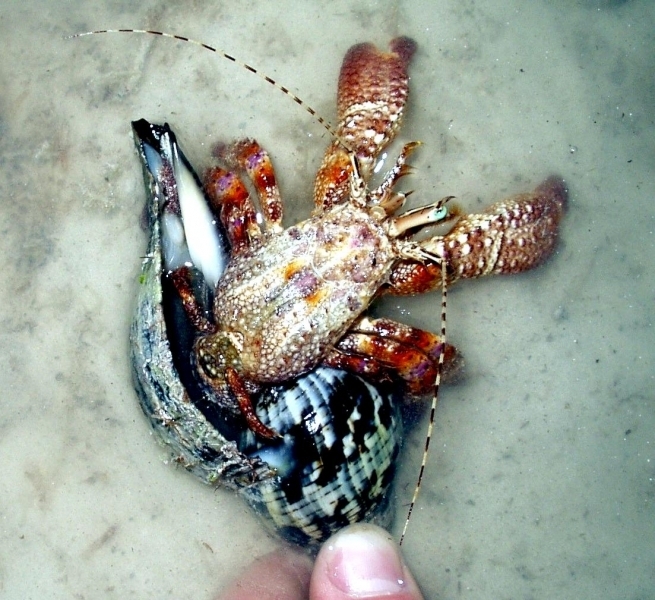 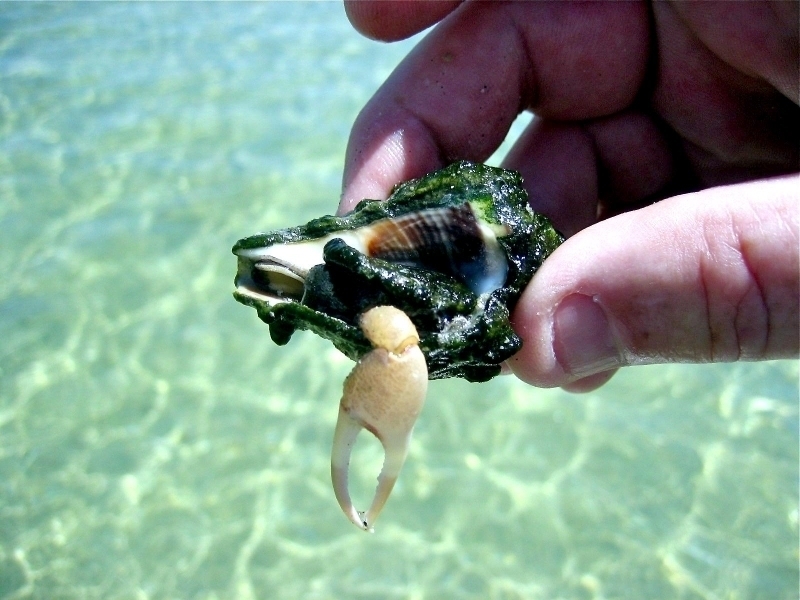 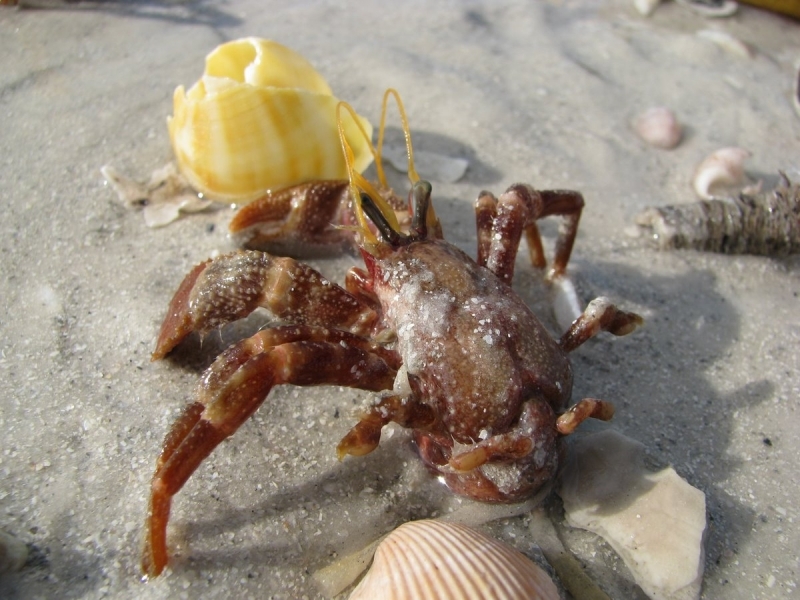 Hermit Crabs are omnivores eating plants & animals and scavengers eating dead animals that they find. 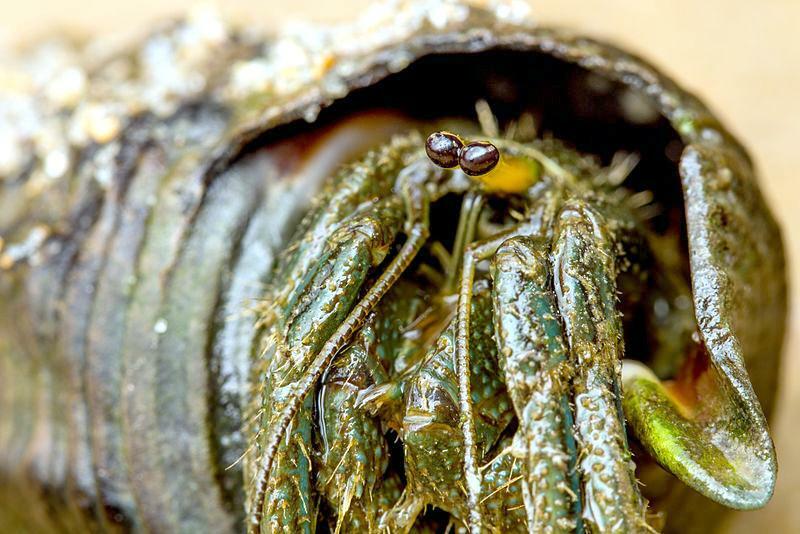 They eat worms, plankton and organic debris. 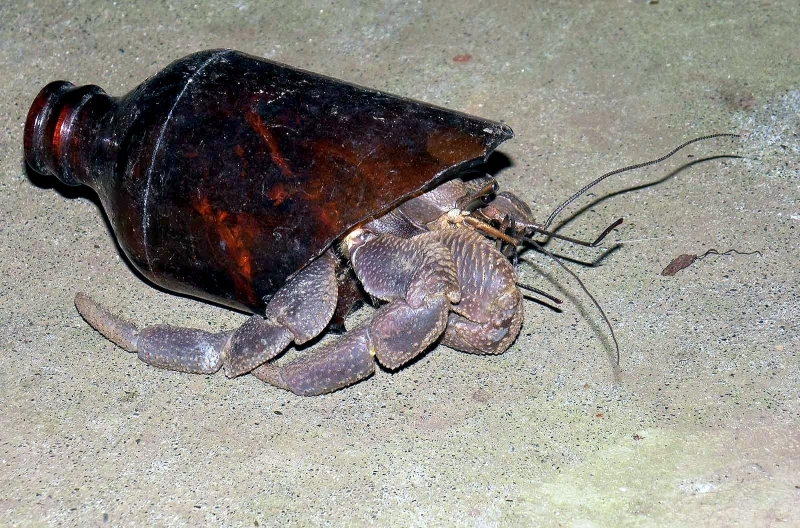 Except for the molting period, when they shed their exoskeleton and move from one shell to another, their soft bodies which are twisted, remain hidden within their shells. 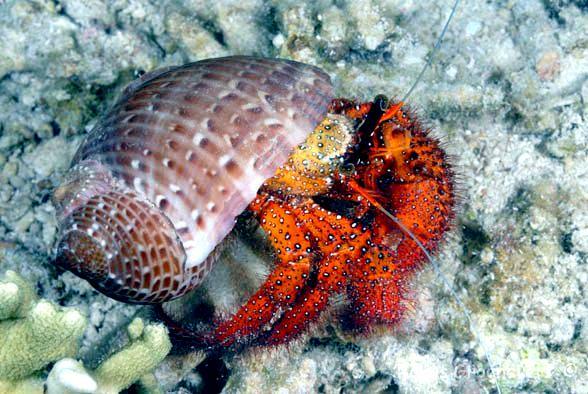 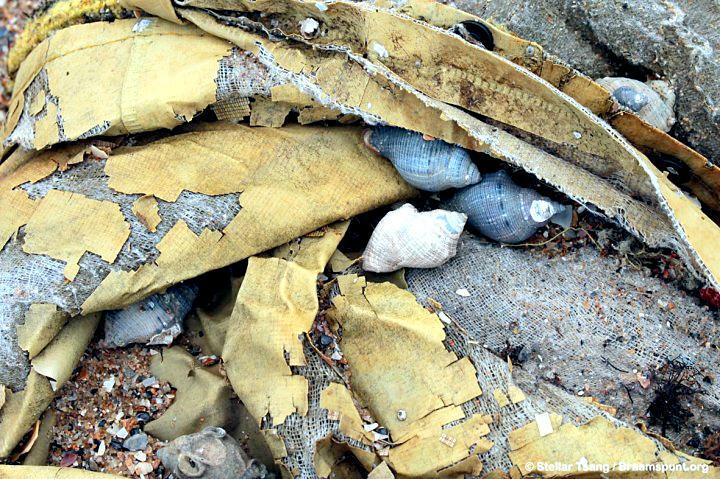 The shell they are in isn’t theirs, they have borrowed it from a sea snail. 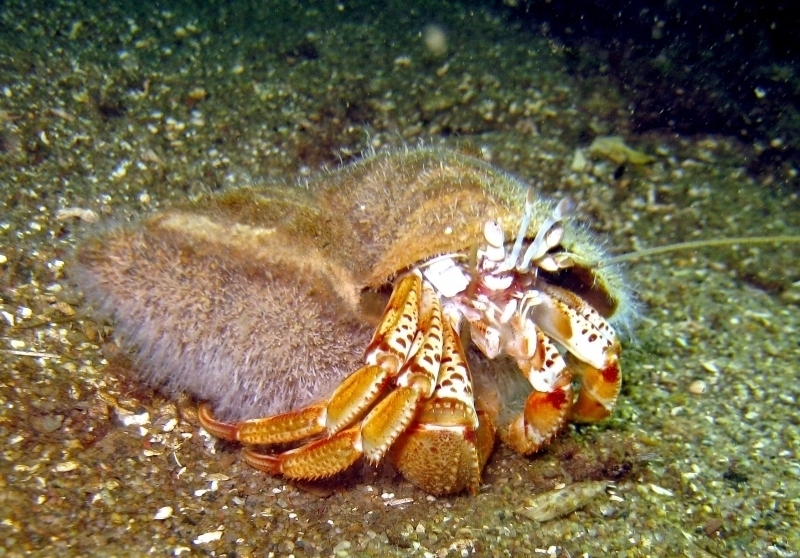 When a crab gets too big for its shell, it moves to another one. 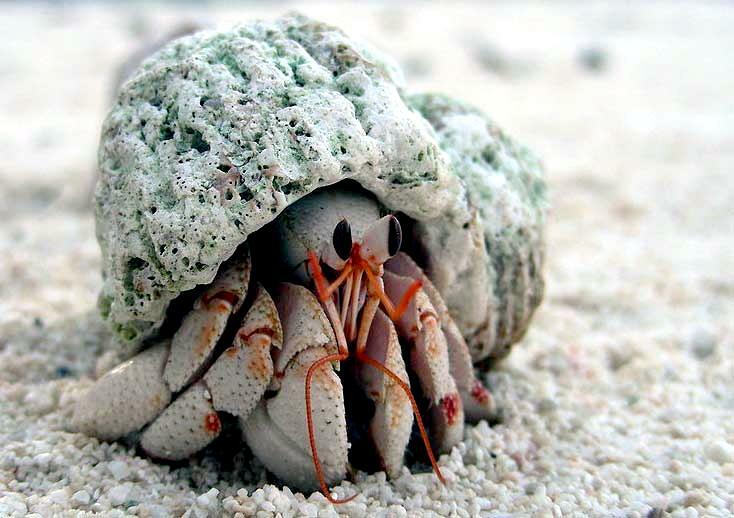 There are quite a few interesting Hermit Crab facts associated with where these creatures are found. 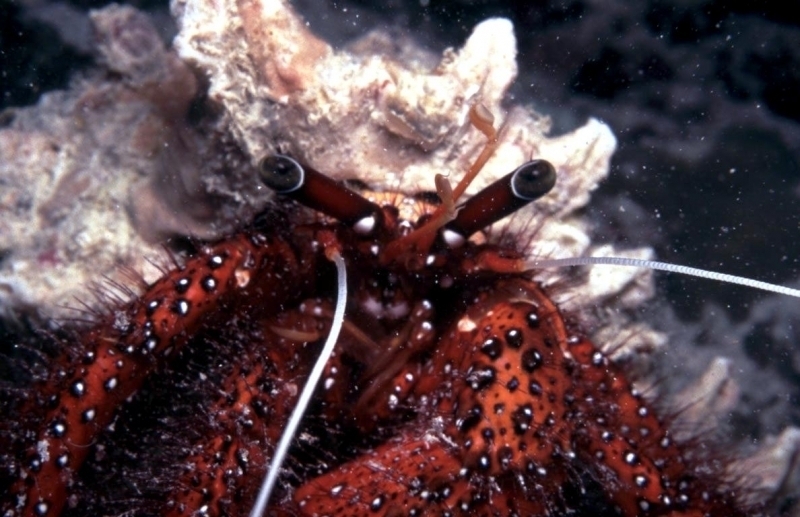 Some of them live on the land and some of them live in the sea. 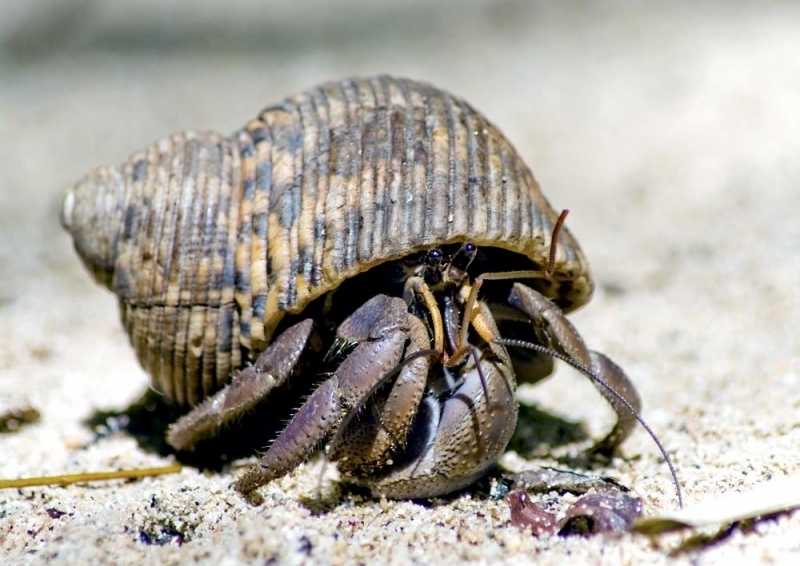 With more than 500 different species, you can understand the variety of types involved here but most Hermit Crabs are ocean-based creatures. 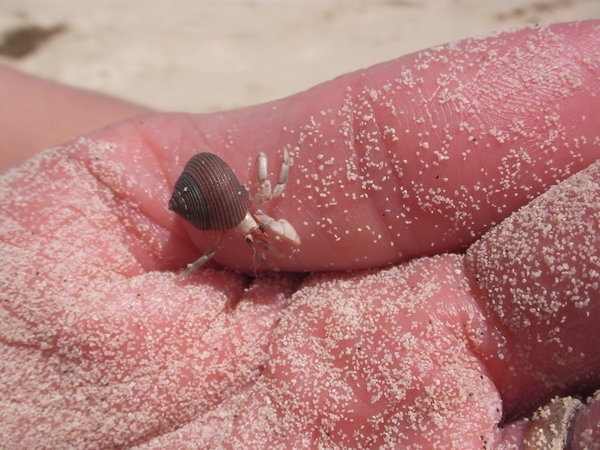 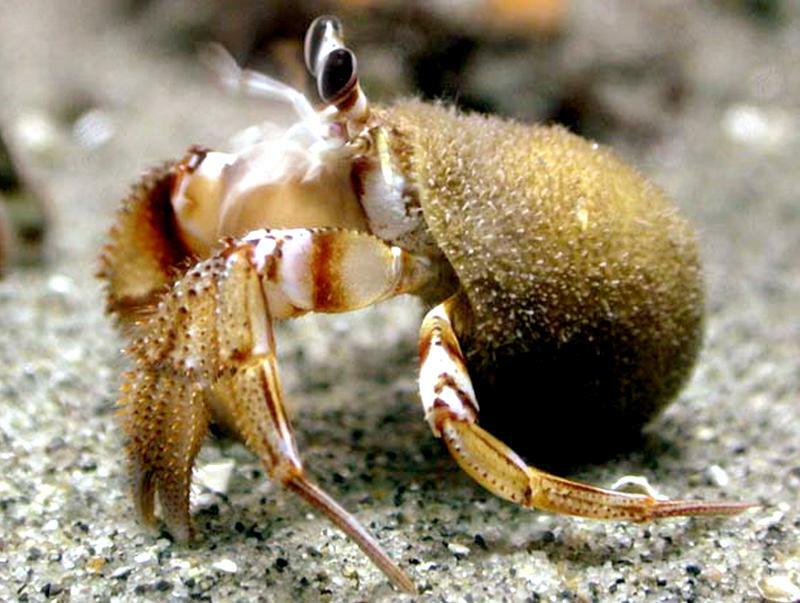 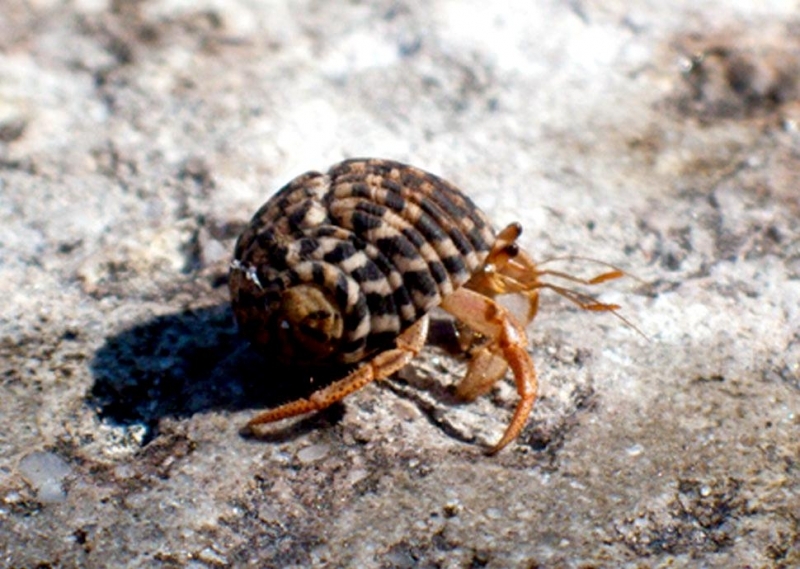 During their life cycle, a female Hermit Crab releases her fertilized eggs into the ocean. 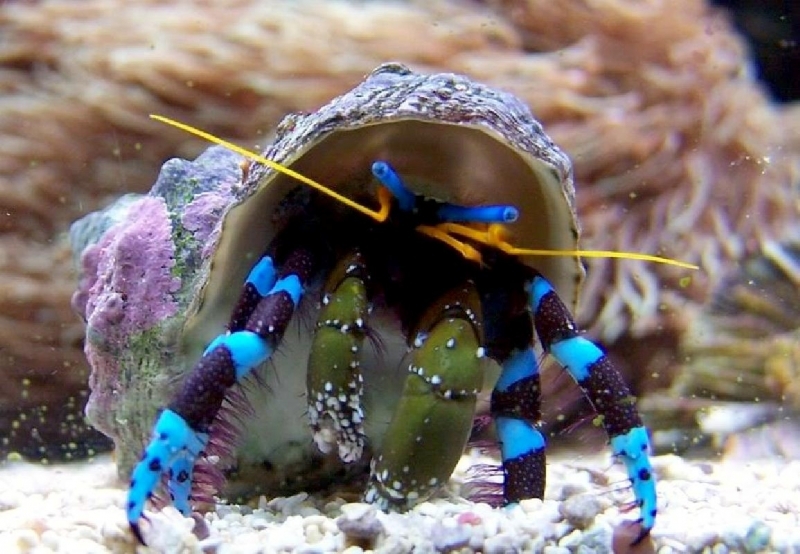 Because most crabs reproduce in the ocean, they can not be bred in captivity. 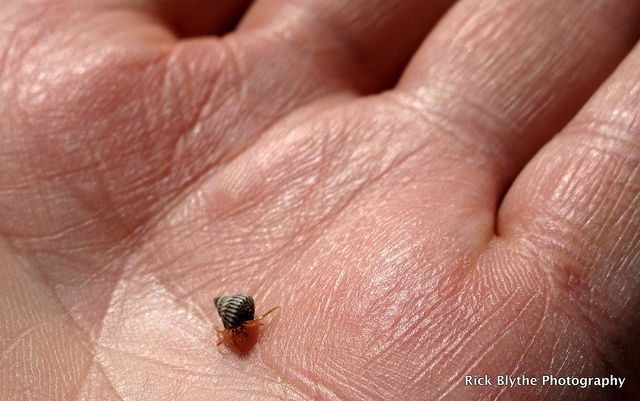 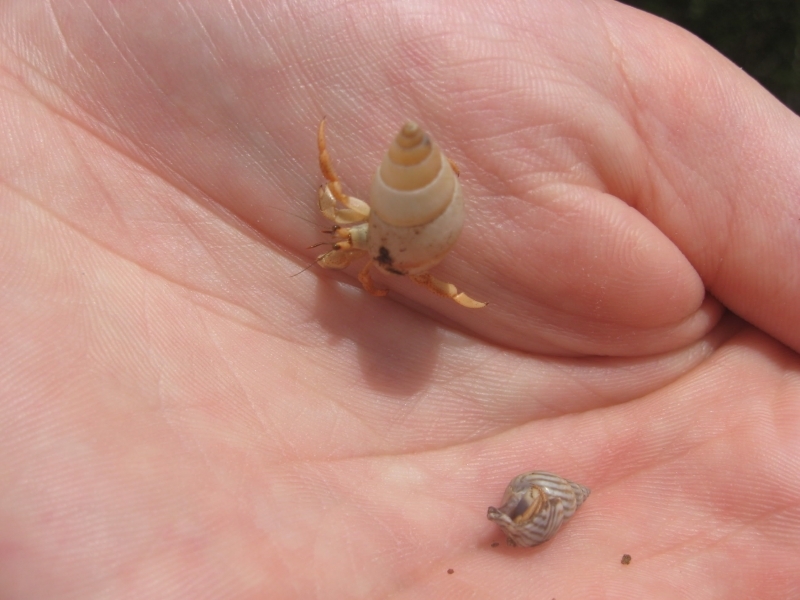 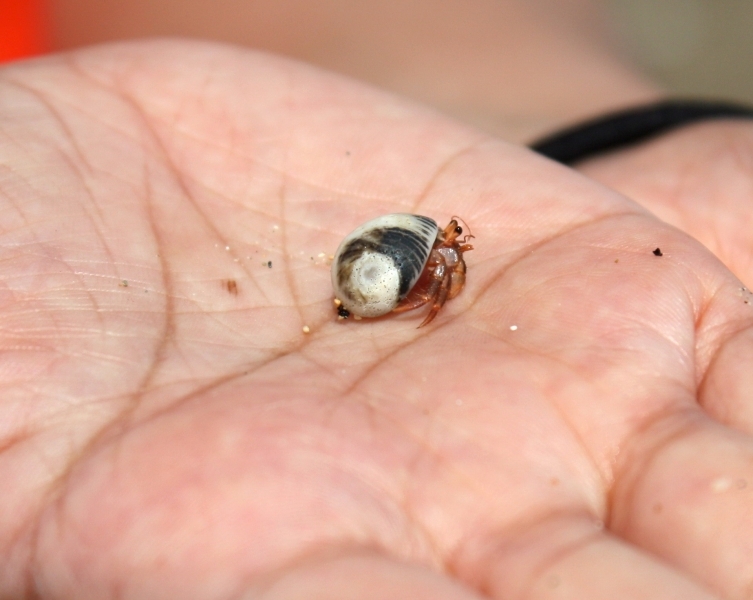 Once in the larval stage, the baby Hermit Crabs grow through the molting process. 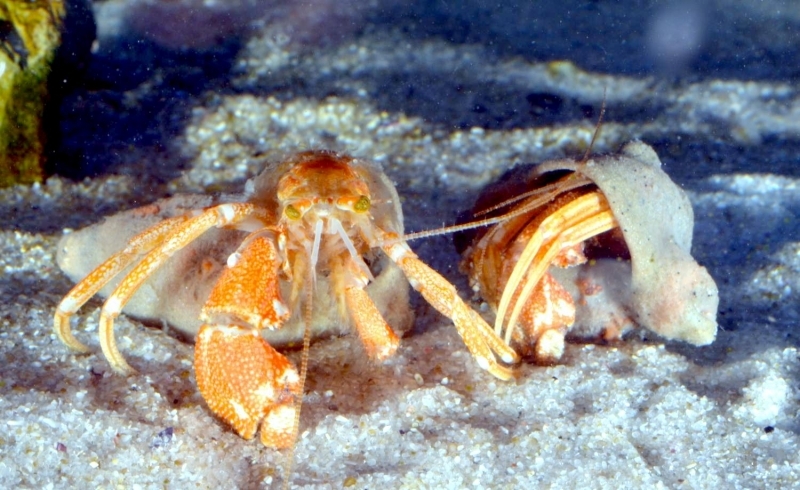 All Hermit Crabs molt. 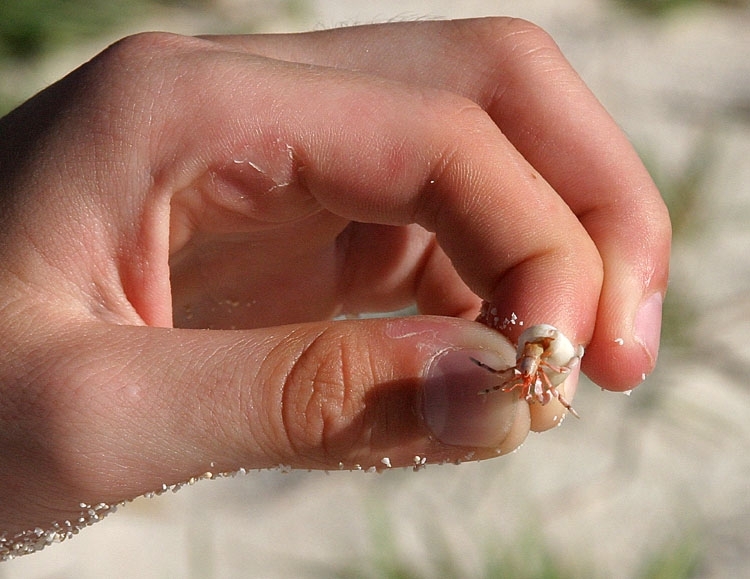 The younger ones, because they grow at a faster rate, can molt every few months. 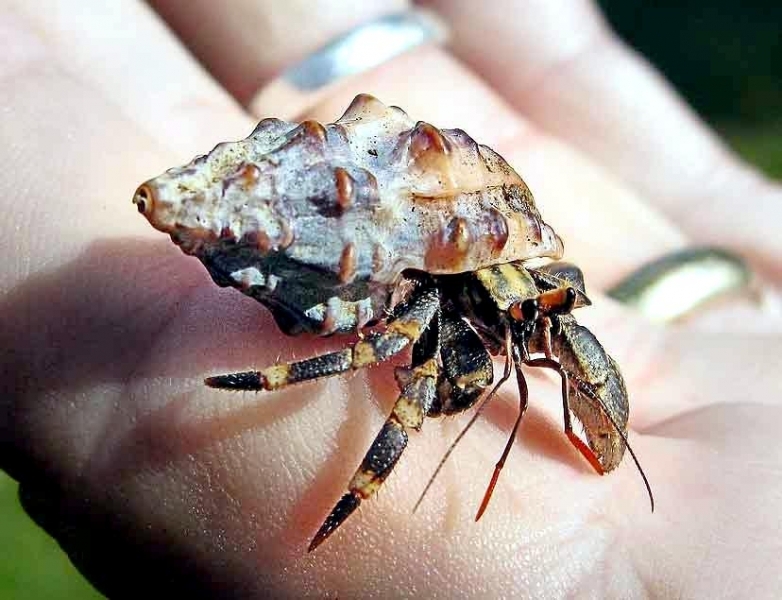 Adults tend to molt every 18 months or so.